Read our new and improved monthly Newsletter. You will find out about upcoming events near you, opportunities to volunteer, news from the DNC meeting in Texas last month, what you can do to help President Obama pass health care reform and much, much more! Let us know what you think. 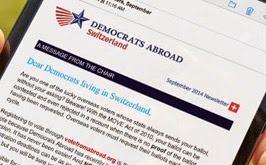 Send us a note at chair@democrats.ch. Click on image below to view Newsletter! Check Calendar Tab above for event updates during the month and for more event listings.